Gloria was missing for over two weeks, and nobody had any idea where she was. All they knew is that she was likely to be with Uman, a new boy in the area who seemed to have a hold over Gloria. There’s no getting away from the fact that Gloria is an incredibly selfish character, who really seems most naïve in some ways. She is suffering from a state of perpetual boredom, and is clearly struggling to feel loved in a family where her brother has left for university and her parents are busy with their own interests. It’s little surprise that when Uman comes along she falls quite heavily for him. He’s different, doesn’t want to do the same things as her friends and has a strong sense of self-confidence that must be very appealing for a young girl who is so full of self-doubt. When we first meet Gloria she is sitting with her mother in a police interview room, about to speak with the police about where she has been for the last fifteen days. Slowly, we are told some of the details about how she and Uman arrived at the decision to leave their homes and what they did during the time they were away. Gloria’s parents and the police seem convinced that Uman manipulated her into running away, but Gloria’s story denies this. Throughout the story I have to confess to thinking how immature the two main characters were. Simply using ‘big words’ doesn’t make you clever, and the issues that they face when they are hiding out reveals clearly just how ill-equipped they are for looking after themselves. 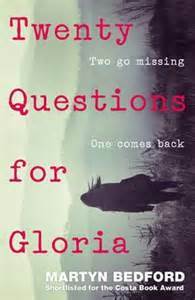 There are hints throughout that there is more to Uman’s story than Gloria is told; we never get a satisfactory answer to this. This had the potential to be a great story – sadly, it never quite got there in my view.